26 degree - Similar to "Yellow" blades offered by the plotter manufacturer, except GAP plotter blade tips have the advantage of being constructed out of carbide, not stainless steel! 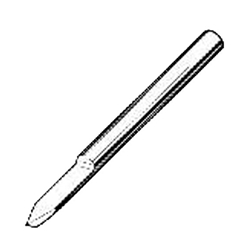 Carbide tipped plotter blades offer much better durability and longer performance. For best results, use this blade angle when cutting material with a 2-4 mil thickness. 40 degree - Similar to "Red" blades offered by the plotter manufacturer, except GAP plotter blade tips have the advantage of being constructed out of carbide, not stainless steel! Carbide tipped plotter blades offer much better durability and longer performance. For best results, use this blade angle when cutting material with a 4-12 mil thickness. 59 degree - Similar to "Blue" blades offered by the plotter manufacturer, except GAP plotter blade tips have the advantage of being constructed out of carbide, not stainless steel! Carbide tipped plotter blades offer much better durability and longer performance. For best results, use this blade angle when cutting material with a 12+ mil thickness.